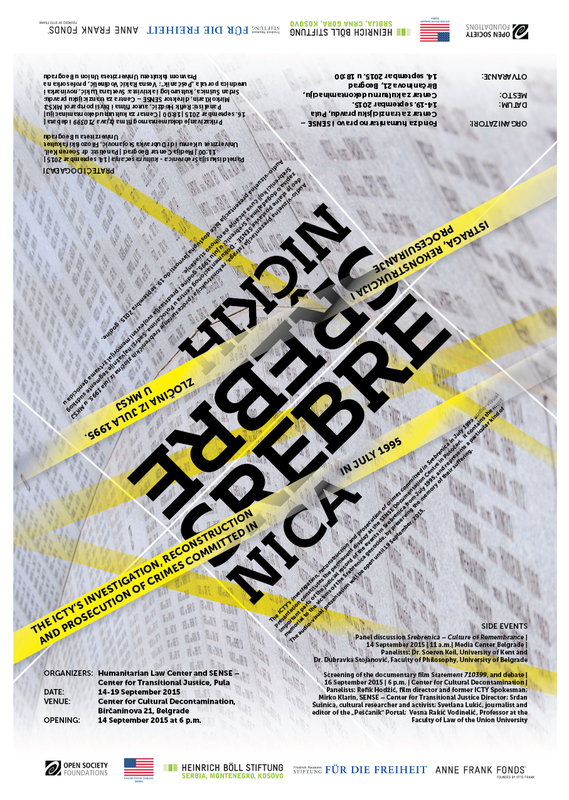 The Humanitarian Law Center and SENSE – Center for Transitional Justice will host the opening of the Audio-Visual Presentation The ICTY’s investigation, reconstruction and prosecution of crimes committed in Srebrenica in July 1995, to be held in Center for Cultural Decontamination in Belgrade on September 14th 2015, at 6 p.m. The ICTY’s investigation, reconstruction and prosecution of crimes committed in Srebrenica in July 1995 audio-visual presentation constitute the permanent display of the SENSE Documentation Centre, based within the Memorial Center in Potočari. It contains the most important parts of the judicial record of the events in Srebrenica from July 1995, and represents a particular kind of memorial to the victims of the Srebrenica genocide. Twenty years after the genocide in Srebrenica, the institutions and most of the public in Serbia still deny and relativize the crime. The reluctance to accept the facts and legal qualifications, which have been established before international and national courts, insult the victims again and hamper efforts to establish trust. The aim of the Presentation is to provide insight into the way in which the crimes, committed in and around Srebrenica in July, were investigated, reconstructed and prosecuted in trials before the ICTY. The Presentation will be available to the public in Serbia every day from 11 a.m. to 19 p.m. until 19 September 2015. More on the panel discussion can be found here. The participants in the debate are: Refik Hodžić, the author of the film and former spokesperson for the ICTY; Mirko Klarin, Director of SENSE – Center for Transitional Justice; Srđan Šušnica, a culturalist and activist from Banja Luka, Svetlana Lukić, a journalist and editor of the “Peščanik” portal and Vesna Rakić Vodinelić, a professor at the Law Faculty of Union University in Belgrade. Among other things, the participants in the debate will discuss the moral, legal and historical heritage of the Srebrenica genocide in Serbia and societies in the region, the possibilities to create trust and joint memories on that atrocity and other crimes, and the significance of court-established facts in this process. The debate will be moderated by Sandra Orlović, Executive Director of the Humanitarian Law Center. A synopsis of the film is available here. We would like you to join us to each of the above-mentioned events. Simultaneous interpretation in English will be provided for all events.